First published in 1982. 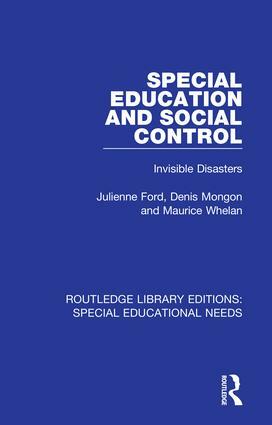 Between 1955 and 1980 the number of pupils in special needs schools in Britain increased tenfold. Between 1970 and 1977 the number of units for ‘difficult’ pupils also increased tenfold and went on increasing. Some observers saw this as a welcome advance in special education, others as an extension of discrimination. The authors of this study highlight the dangers of such a provision being used as a form of social control, which may be imposed on children whose only failure is an inability to fit into the stereotype of the ideal student.